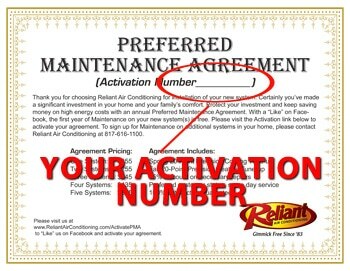 Activate Your Preferred Maintenance Agreement Today! I understand that my one-year Preventative Maintenance Agreement is for the recently installed system(s) only, and that additional maintenance for any existing systems may be purchased separately. Agreements are good for 365 days from date of initial installation date. I also understand that I am responsible for calling and scheduling my Spring and Fall Tune-Ups during the appropriate seasons, and that tune-ups must be scheduled for completion during regular business hours.